This past Christmas, my bro-in-law and his lovely wife came to stay with our little family. He is studying medicine in Iowa. He is really big into preventative medicine through making healthy food choices. He always brings me delicious and nutritious recipes to try, and this trip he did not disappoint. 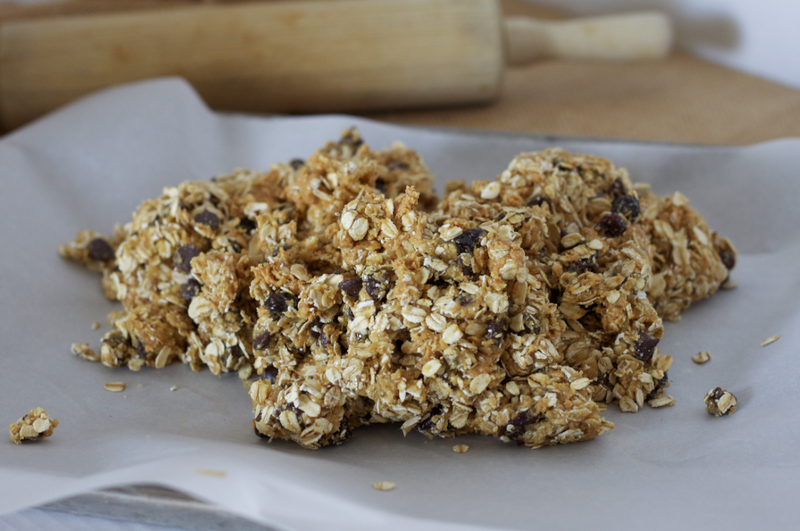 These little homemade granola/powerbars are the PERFECT treat. 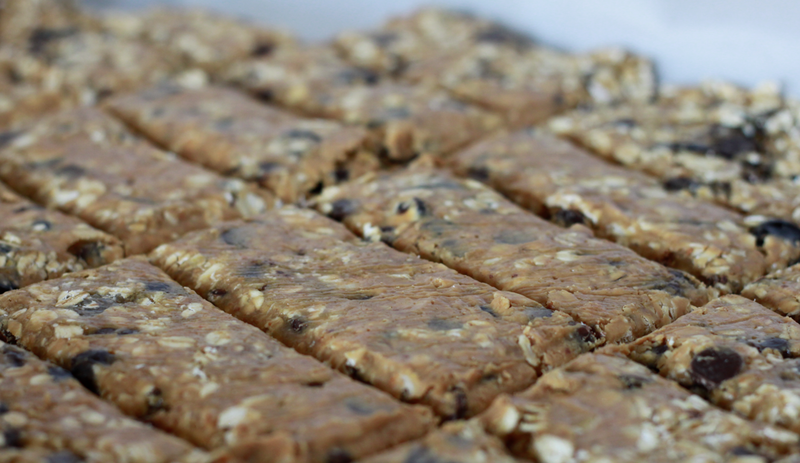 The are packed full of nutrition and are absolutely delicious! I love them, my husband loves them, and the kids LOVE them! The best part is how incredibly fast and easy they are to make. 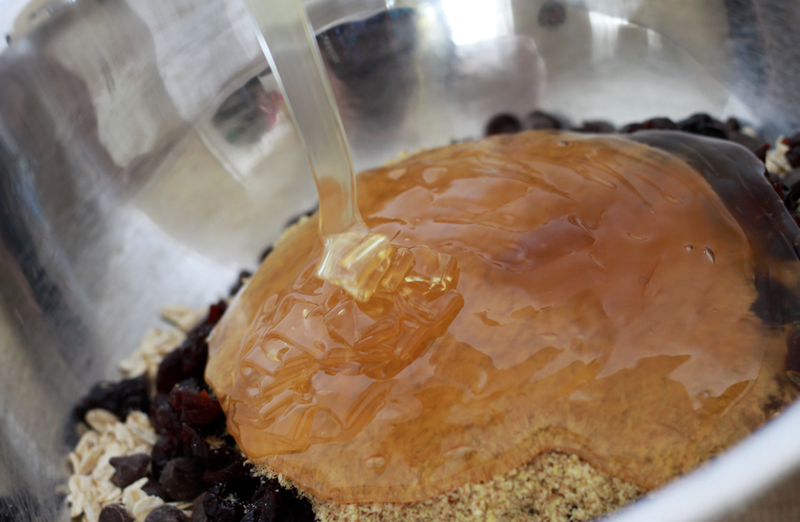 Mix all ingredients together and stir until well blended. Spread mixture onto a cookie sheet or pan and refrigerate until ready to serve. Store in the refrigerator for 1-2 weeks or freeze for later use. I cut them with a pizza cutter after they have set for a little while in the fridge. 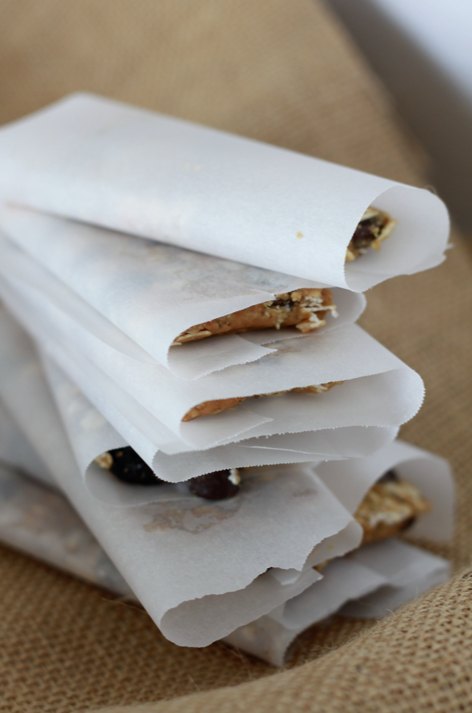 Wrap each bar up in some parchment paper or wax paper to keep them fresh. 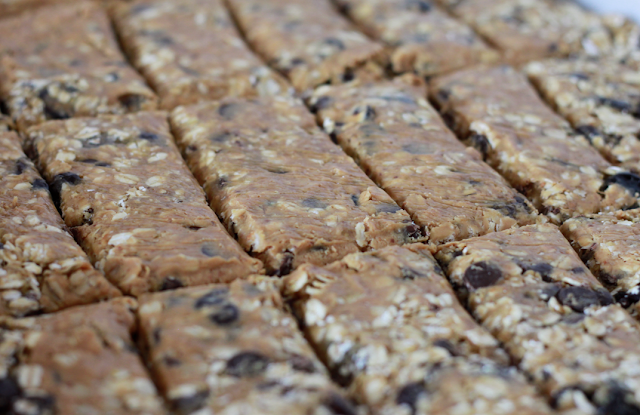 The fun part about these bars is that you can interchange any of the ingredients for a little twist. 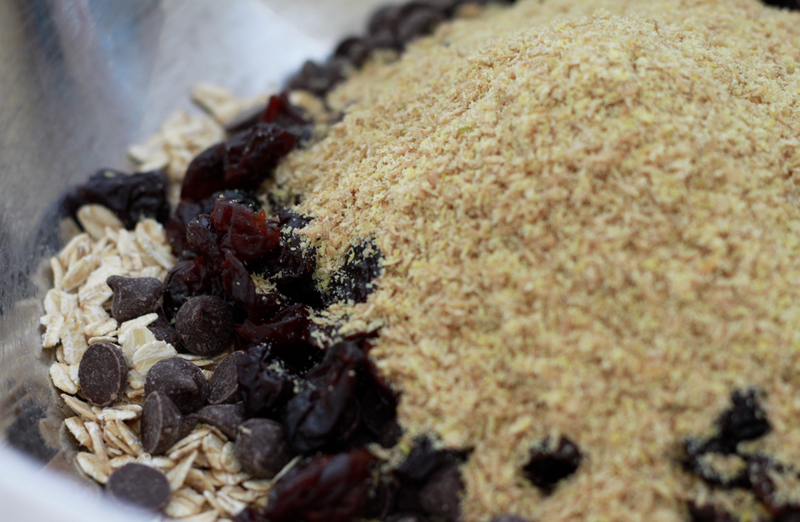 For example you can switch out the chocolate chips for another kind of nut, or maybe dried fruit. Just keep the ratio of each ingredient the same when replacing. These look great! 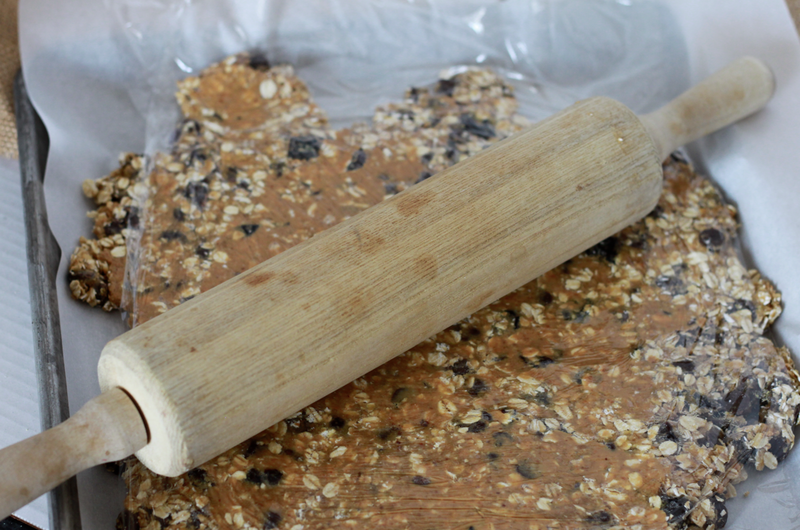 I've been looking for a good granola bar recipe, can't wait to try this one out! Uhh... Yum! What a fantastic, healthy snack- thanks for posting this! oh wow! so quick and looks really yumm !thanks for sharing! My gosh this looks good (and so easy to make!) The possibilities for various combinations of healthy ingredients is virtually endless, and way better than the store-bought stuff that my husband always brings home. Thanks for providing the recipe. I can't wait to try it this weekend! Just made these!! They are delicious! Thank you! These are delicious! I made using mini chocolate chips and they were a family hit! Making more tonight. Thinking my next combos will be white chocolate chips with dried cranberries, mini chocolate chips with mini marshmellows and mini m&m's with...something! Thanks for the great recipe! I have made this recipe twice now... I love it! What's more, my kids love it! I have one early when I first get up--well after the coffee brews! Keeps me strong until around 10:00-10:30am... and I have seen other benefits as well... I'm not driving to work with nawing hunger pain & crabbiness... & I'm not tempted to drive thru a fast food place... Who knew it could enhance a persons well-being so much??? lol! I will be making this every weekend for the week ahead! I also like that it's a very forgiving recipe... with so many variables! I've made these twice now & they're wonderful! Quick to put together, easy to wrap & package for the up coming week, so versatile, healthy, & tastes so good! what more could you want from a recipe? I think they're best fresh out of the fridge when they're really cold! great! Good job, Girls!